2 VINTAGE DARTINGTON WINE MASTER CRYSTAL VERY LARGE BURGUNDY WINE GLASSES - 9"
Contemporary Tall Dartington crystal Glass Decanter Wine, Port, Sherry Etc. Dartington Crystal Ugly Head vase by Frank Thrower circa 1968. In Good condition bar a small ring of clouding, has obviously been used as a vase. 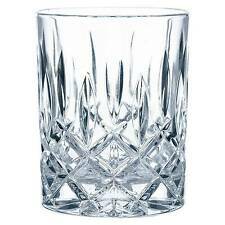 Stunning little tankard by Dartington Crystal. Limited edition 462/1000. 4 Dartington Glass Tumblers. Condition is Used. Dispatched with Royal Mail 2nd Class. B eautiful modern contemporary designed Dartington Candle Holder in frosted glass. Quality, heavyweight piece. If you know Dartington then you know that these lovely glasses are hand blown and not mass produced rubbish. If you know the New World collection then you probably not only know what beautiful glasses they are but also that they are no longer produced. dartington stemless wine glasses. Condition is New. Dispatched with Royal Mail 2nd Class. A Dartington glass posy vase, designed by Frank thrower in 1968, with the Greek key design. Colour - Kingfisher. A squat vase which is 9cm tall. Two new glasses from the Tony Braithwate signature series. It has the original Dartington sticker on it and the logo etched on the base. 6 Darlington Crystal Daisy Dessert Dishes. A lovely pair of Dartington Crystal champagne flutes which I think are the Sharon pattern. Excellent condition. 91/4 inches tall, 23.5 cms. Marked to base as shown. 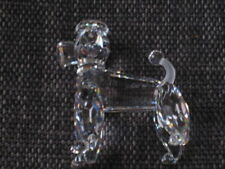 Vintage Dartington Glass Etched Crystal Rabbit Sculpture or paperweight. Its signed to the base A Capredoni. Dates from late twentieth century. Good undamaged condition Dispatched with Royal Mail 2nd Class. Decanter is 31cm tall; Glasses are 24.5 cm tall. 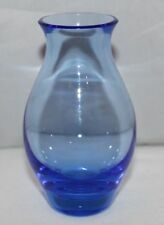 Dartington Water Carafe and Glass.Unused,Excellent condition. Dispatched with Royal Mail 2nd Class. Much of our range continues to be hand crafted in ourDevon factory. Supplied in an attractive sleeve box for a great gift solution. A great all purpose choice for wine, spirits, water and soft drinks. Dartington crystal pair of chalice glasses blue stem,white wine . Dartington crystal pair of chalice glasses blue stem,white wine .. Condition is Used　but very good clean condition. These are the blue stem also came in green and clear. A three piece mouthblown glass from the Dartington factory in Devon. This is the white wine size . Capacity 17cl.170ml. sandblasted,etched Dartington on base. I guarantee all items if you are not happy with your purchase I will return monies on return of goods within 14 days. I will post Royal mail signed. Royal mail does not compensate for glass. A Dartington glass posy vase, designed by Frank thrower in 1967, with the 'abstract' design. A squat vase which is 8.5cm tall. Colour -Midnight. Design FT 2. I try to be accurate when describing an item. Any mistake on my part would be a genuine one as I have no wish to mislead anyone. Dartington Crystal Bordeaux Wine Glasses X 2 - Tony Laithwaite SIgnature Series. Condition is New. Dispatched with Royal Mail 2nd Class. 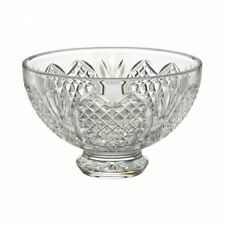 New listingTwo Dartington Crystal Glass Daisy Two Shallow Dishes FT206 - 17.5cm/6.9"
A lovely design and perfect for desserts or nibbles. An unused original Dartington handmade 'The Wine Carafe' (ref: FT196) with frosted/sandblasted word 'vin' on the side and cork stopper, designed by Frank Thrower, in its original box. We decided not to wash it out, as it still has the Dartington logo label attached, so have left it as it is, so it can be seen that it is in unused condition, as can also be seen from the unused condition of the cork stopper. Dartington Crystal. Dispatched with Royal Mail 2nd Class. I recently sold my first 6 DARTINGTON IRISH COFFEE GLASSES, now I'm ready to part with the next set of 6. All 6 glasses are in pristine condition. Three vintage Dartington Crystal items. Honey pot FT324 complete with original glass spoon. 12x12cms. Hollywood bowl FT243 13.5x7cms, and Rosette bowl 10.5x6cms. All are in perfect condition, no chips, cracks or scratches. RARE DARTINGTON GLASS TANKARD HART ON A ROSE BY FRANK THROWER 1980 WITH ORIGINAL BOX THE DARTINGTON SMALL BADGE AT FRONT OF TANKARD NOT THERE. Produced by Dartington to celebrate the Queen's Diamond Jubilee, and a special promotion with Finish dishwasher tablets, to demonstrate that the glasses are dishwasher safe. (Plain brown, not presentation box.). Dartington Glass 'Regency' pattern water goblets/glasses. Each 5 " tall and 3½ " wide at the rim and 3" wide across the foot. DARTINGTON BULLDOG FT111 3. DESIGNED BY FRANK THROWER. ONE GLASS RETAINS ORIGINAL LABEL. HAND BLOWN SO MAY HAVE FEW. There is the tiniest age related flea bite indentation on the rim - see the last photo. I try to be accurate when describing an item. Any mistake on my part would be a genuine one as I have no wish to mislead anyone. FROM DARTINGTON CRYSTAL-COST LOADS. THIS IS UNUSED BOXED SET OF 2 GLAMOUR GLASSES. FROM THEIR GLITZ & GLAMOUR RANGE. VINTAGE DARTINGTON GLASS WINE CARAFF / DECANTER 14" X 4.5"
A beautiful pair of Dartington high performance lead free crystal carafe's and solid wood stand. Dishwasher safe, shaped for flavour and brilliant clarity. Signed on base. Never used - still with Dartington stickers and in boxes. Thank you for looking. ❈ MAKER IS DARTINGTON. ❈ A BEAUTIFUL PAIR OF VERY LARGE CRYSTAL WINE GLASSES. ❈ CAPACITY IS VERY GENEROUS. As such they will not be in 'new' condition. ❈ QUALITY IS VERY GOOD. ❈ VERY GOOD CONDITION as per the photos and report.